I love the abundance summer brings. 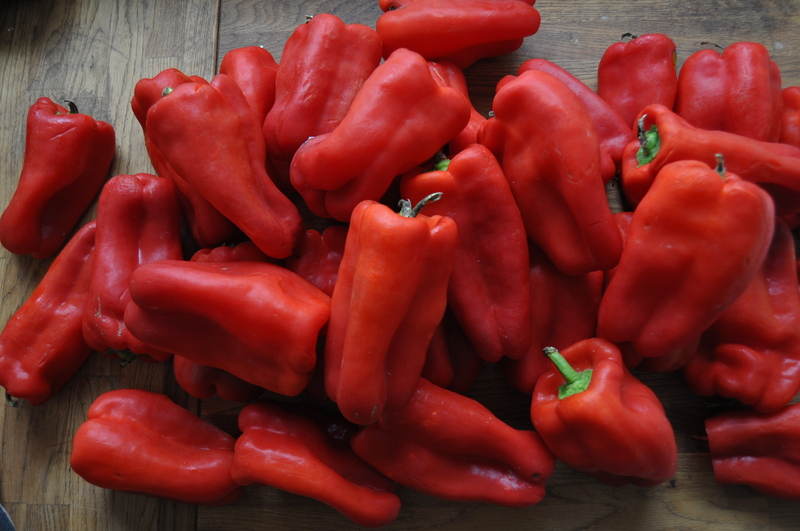 I went to the market today and this happened…..
…a beautiful box of organic bell peppers for a steal. During these last few weeks of summer, I am frantically preserving all of the fresh produce I can. I strive to buy local as much as possible (and produce a lot of my food from my own backyard) and always experiment with new ways to make the harvest last. I am not sure what my aversion to freezing is. I know a lot of people prefer to store their produce this way and while I do freeze berries and corn (and God knows how many bananas! ), that’s about it. The rest of summer’s goodies are fermented, canned, or preserved using the method below. These peppers will last in the fridge for 1 year, giving you a little flicker of summer memories throughout the grey winter. My favourite ways to use these are on pizza, draped over sourdough toast and broiled with a little high quality cheese, stirred into pasta dishes, or as part of an antipasti platter. Multiply this recipe as needed. The recipe below makes about 1 quart. I quadruple it to make enough to last through the year. 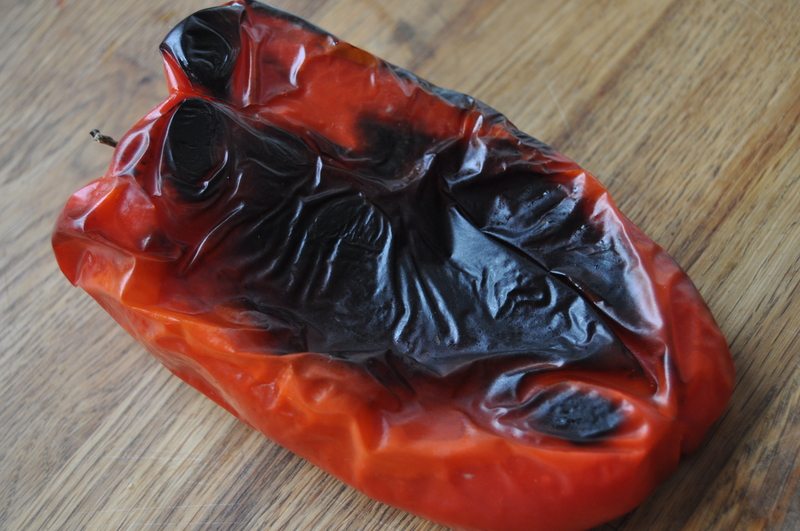 Pre-heat oven to 475° F. Lay peppers (whole) in a single layer on the baking sheet. Place in oven and roast, turning occasionally for about 20 minutes, or until the peppers are mostly blackened. Remove from oven. Place in bowl and cover with plastic wrap (this allows you to easily remove the skin). Allow the peppers to cool. Allow to marinate for approximately 20 minutes. 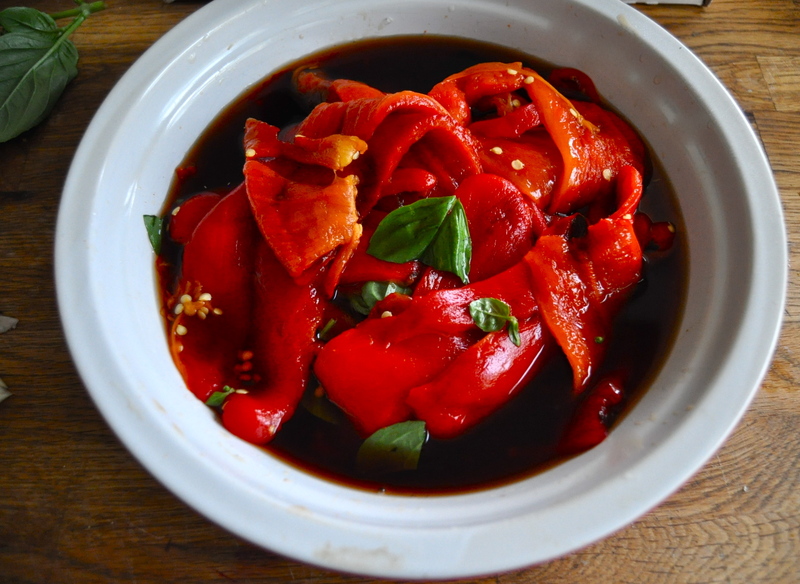 During this time the peppers should release juices, combining with the vinegar. Pack into your sterilized mason or fido jars. Leave approximately 1/2 inch headspace. Pour the pepper juice/vinegar mixture from the bowl over the peppers. The juice should cover the top of the peppers. Cover the peppers with 1/4 inch extra virgin olive oil. This is my favourite part! I’m not sure why I love seeing the oil form a layer on top of the vinegar, but I do 🙂 Secure the lid on the jar and move to the fridge. Peppers will last for a year. 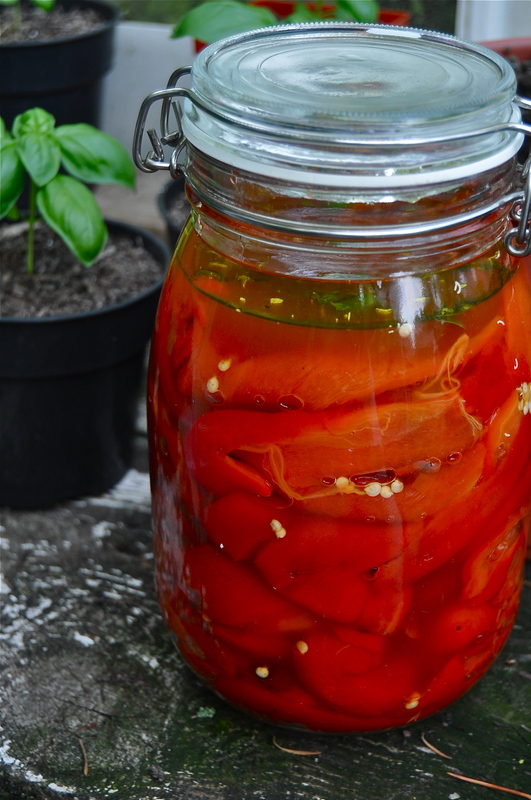 This entry was posted in snack, vegan, vegetarian and tagged canning, dairy free, gluten free, harvest, healthy, local, olive oil, organic, preserved, recipe, roasted red peppers, summer, vegan. Bookmark the permalink.